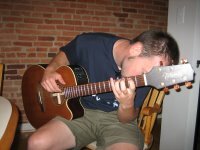 i shopped for a guitar earlier this summer, but nothing clicked. after returning from karachi, the need for my own instrument grew ever pressing. i was a woman on a mission. mike came along for moral support, which i really needed. we walked in and spotted a few options, though i was too intimidated to play while some old guy rocked out on slide guitar close by. i was off to a rough start. then a sales clerk walked up and offered to play for me so i could listen for the tone i was looking for. i explained that i wanted a small body guitar, but not so small that it sounded brassy. he was very helpful and found several that i was okay with. then, he handed me lucinda. she was beautiful. she fit in my arms perfectly. her deep tone went straight to my heart. reluctantly, i looked at the price. totally in my range… on the lower end of my range, even. that’s when i took a closer look and found she looked pretty worn on the back and neck. just love marks. nothing that would jeopardize the musicality of the instrument. i asked the handy sales clerk if he could throw in a case? yes. strap? yes. chord? yes. picks? yes. can i choose my own color of picks? yes. can mike have one too? yes. can i have a moment alone? okay. we called erin and brian for back-up, who checked online to confirm this was indeed a good deal. fully confident, i handed the sales clerk my card and brought lucinda home. no buyer’s remorse. just true love. one step closer to being on stage… kidding. or not. Congrats Lauren! I just added an electric ax to accompany my cheap as dirt accoustic. We gotta get together and jam out, yo.